Only one thread per artist and one artist per thread. This keeps artists with many doll sculpts from dominating the community and allows all artists a chance to shine! Discussion threads may be created by the artists themselves, or by a fan. If a fan creates a thread and then the artist later joins the community, the artist has the option to start a new thread themselves. The old fan-created thread will then be locked with a link to the new thread posted. 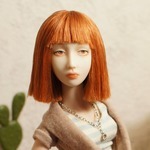 This gives artists the opportunity to be in control of the first post in a thread, creating a mini-wiki where they can post doll information, an artist's bio, photos, etc. Please format thread titles with the company name and the artist name, without extra symbols, extra capitalization, or emoticons. This makes it easy to find threads and presents all artists equally. Improperly formatted thread titles will be edited. You may use this list as a simple form to fill out, or do something more creative! Artists especially are encouraged to use banners, special fonts, and creative presentation (in the first post only). Just remember to keep things readable. The more information you include the more useful and interesting it will be!